FIFA 12 has a lot to live up to. The previous FIFA 11 was a decent football game, perhaps the best the series has produced on mobile so far, but still some way off Pro Evolution Soccer, with the Konami game really enjoying itself on the new format. 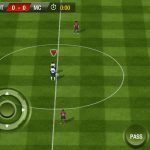 There is even the spectre of Real Football, as Gameloft’s fledgling series has hit the ground running ever since its first iteration. Thankfully, FIFA 12 does live up to expectations, and is perhaps the most realistic and satisfying football/soccer game yet released for a smartphone, although it does have a big, wide glaring omission, but more on that later. The first major change, and the most important for FIFA fans, is that the gameplay and the feel of the game is now very close to what you would expect on a home console. 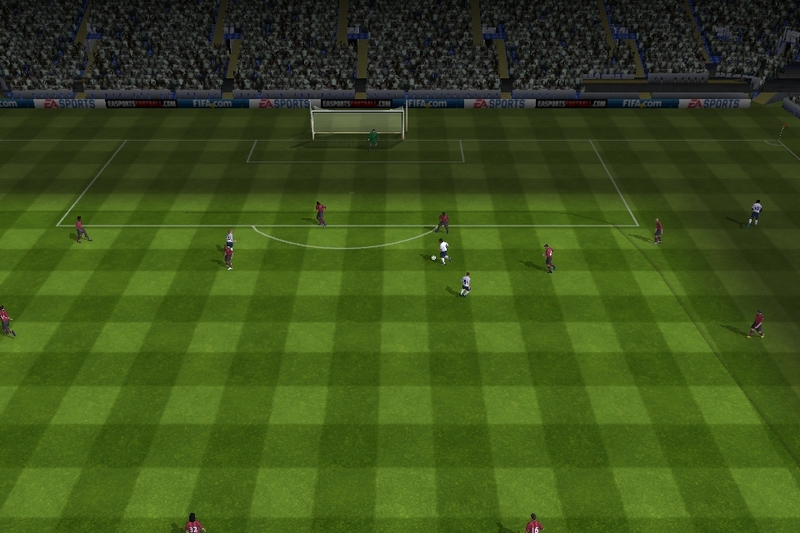 FIFA 12 has a context sensitive control system, based around three virtual buttons that allow you to perform almost every pass or shot imaginable. Stroking a lofted pass out to the wing now looks and feels as it should, and through balls, both on the ground and in the air feel natural and perfectly balanced. This is helped massively by the improved player A.I. with teammates making space and performing runs in a way that is very impressive. I think the great thing about the context sensitive buttons is that each button isnt confined to ‘pass’, ‘shoot’ and run, but are really mixed up. Tapping the shoot button does as you would expect, and dragging up from the shoot button performs the expected lob, but you can drag down from the pass button to try a finesse shot. The run button is also well used, and it is this intelligence of control that makes the game feel so good. It is a shame that the goalkeeping is so terrible. Even on the hardest difficulty the goalies will have trouble saving any shots. It is a real shame, as it does spoil things somewhat when you can shoot from near the halfway line and score more often than not. The touchscreen is used well in set pieces such as free kicks, where you can simply touch the player you want to try to pass to, or swipe the screen to try a shot. It’s a good combination, and shows that EA have been thinking about how to improve all aspects of the game. There is a nice smattering of game modes, such as a quick match and a clever daily challenge, but the mode I’m sure most of you will be spending your time in is the manager mode. Yes, manager mode is now mobile, and you can take your favourite team and micro manage to your hearts content. All the main options are present and correct, including a worldwide transfer market, the ability to alter every aspect of your line up and strategy, and even the ability to upgrade your stadium and staff. The manager mode here is actually better than last years console efforts, although not quite as thorough as this years PS3/Xbox efforts. There is a big thing missing though, and that is any kind of multiplayer action of any sort. Yes, there is no online, Wi-Fi or even BlueTooth included at all, which to be honest is a big disappointment. You can hook the iPhone version to the iPad title and use the iPhone as a controller but really; wouldn’t the time have been better spent creating a simple two player Bluetooth mode? The graphics are smooth and good looking, although I have to say the players look horrible up close. The commentary is great, and while there is no Game Center support there is the option of connecting to EA’s own Origin service and the game does have its fair share of achievements, some of which are linked to the daily challenge feature. Overall, this is an excellent game of football, with great gameplay and fantastic manager mode. The experience is marred by the dodgy goalkeepers and total lack of multiplayer modes, but this is still a must buy for any iPhone toting footie fan. 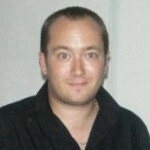 Check out our reviews of FIFA Superstars, management sim Football Manager 2012 and PES 2012! Im in to my second season on fifa 12 on my iphone and everytime i complete my game against bolton in the premier league and it keeps cutting off in to my home page before it saves so it wont let me procede to the next game .. Ive tryed turning off my phone and it still does the same can you help ?